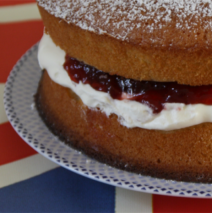 A slice of Queen Victoria sponge cake, assorted finger sandwiches, and our homemade pastries with tea for one. The sandwich selections consist of egg salad, cheddar cheese with a roasted red bell pepper mixed into a spread, turkey and cranberry, and cucumber with a cream cheese and dill spread. In the event, that there are allergies or one is a vegetarian, you may substitute more of one of the sandwiches and eliminate the sandwich flavor that would be an issue. The tea may be refilled with the same flavor, a change in tea flavors would be an upcharge. If you decide to add a scone with cream, jam and butter to the Marlboro it is the same as a Windsor for one which would be $18.00. Like what you see? Subscribe to The Rose today via Newsletter, Facebook, or RSS Feed! I thoroughly enjoyed this “sample” plate. 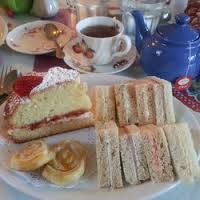 It was a little taste of many wonderful truly High Tea delights. I brought several ladies from my Church (Grace Baptist Church of Eustis), for our monthly “Ladies Day Out”! We enjoyed it so much, we are returning. We took several pictures, if you are interested they will be posted on our Facebook page. God Bless you as you come & enjoy these truly delightful treats.